Marmalade the cat is back and this time he is helping Maddy and Ella appreciate the benefits of making new friends, even if that friend doesn’t do things quite the same way they do. Ella, Maddy and Marmalade love to spend time together. They are having a wonderful time playing when Toby arrives like a whirlwind, full of energy and stirring everything up. Ella and Maddy aren’t so sure about Toby, but when Marmalade is in trouble, the girls discover that sometimes having a friend who thinks differently to you can be a very good thing indeed. 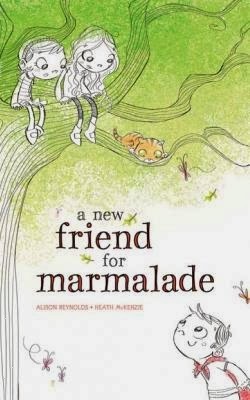 A sequel to the popular picture book A Year with Marmalade, A New Friend for Marmalade is another gorgeous story about friendship. Heath McKenzie’s charming illustrations once again bring the story to life and Alison Reynolds clever text gently encourages children to appreciate the value of making new friends. I love that the Marmalade books teach children about friendship in a gentle way through the story. A New Friend for Marmalade is an enjoyable story in itself while also offering parents and children an opportunity to start conversations about friends and friendship. It also reminds us that sometimes others approach life in a different way to us and that is okay. Reynolds and McKenzie are one of those wonderful picture book partnerships where the words and illustrations seamlessly complement and build on each other to create a story that is both entertaining and meaningful. A New Friend for Marmalade is a gorgeous story sure to be enjoyed by young readers and their parents. You can find out more about Alison, Heath and Marmalade and be in the running for some fantastic prizes by following the A New Friend for Marmalade Blog Tour at the websites listed below (following the book details). Marmalade the cat is full of personality. Do you have a pet with personality? Win a piece of artwork by Heath McKenzie. Send along a photo of your personality-plus pet to Alison Reynolds website, email Alison or upload to Alison's Facebook page. Win an assessment of Chapter One of a chapter book by the fabulous mentor extraordinaire Dee White. Just comment on this blog post or any other blog during the A New Friend for Marmalade blog tour and add the initials DW. The more you comment, the more chances you have to win the draw. Win a free picture book assessment by Alison Reynolds! Just comment on this blog post or any other blog during the A New Friend for Marmalade blog tour and add the initials PB. The more you comment, the more chances you have to win the draw.